Read more about Fainting First Aid & Smelling Salts. Need Smelling Salts? 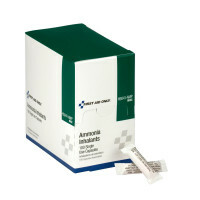 (Ammonia Inhalants) - Look no further! What are the first aid steps for Fainting? • Lay the casualty flat on her or his back. • Elevate the casualty's legs to restore blood flow to the brain. 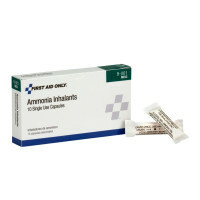 Shake the casualty vigorously, tap briskly, pass smelling salts (ammonia inhalants) under the nose, or yell. If the casualty doesn't respond right away, call 911. Follow CPR instructions if appropriate and if you are trained to do so. If the casualty is alert, give fruit juice, especially if the person has not eaten in more than 6 hours or has diabetes. Do not give anything caffeinated or alcoholic to drink. Stay with the casualty until the casualty is fully recovered. • Hit her or his head when fainting. • Faints more than once in a month, Is pregnant, or has a heart condition or other serious illness. • Experiences unusual symptoms, such as chest pain, shortness of breath, confusion, blurred vision, or difficulty talking. So... Now you know about "smelling salts", syncope & fainting first aid!